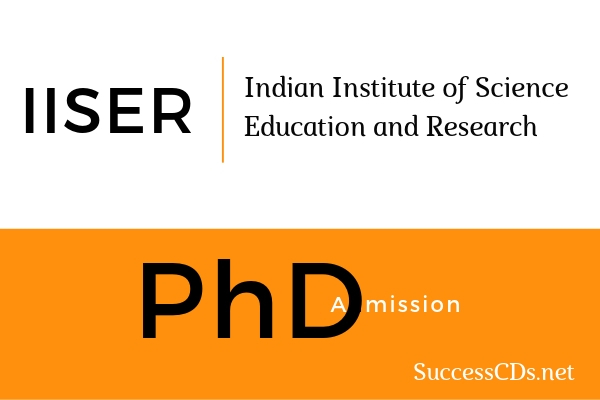 IISER Kolkata Integrated PhD Admission 2019 - Indian Institute of Science Education Research (IISER) Kolkata invites applications from motivated students for admission to the Integrated PhD Programme for the Autumn 2019. Interested candidates can check all the details of IISER PhD Admission 2019 Autumn, like application form, eligibility criteria, application procedure etc from this page give below. Students with a B.Sc./B.E./B.Tech./M.B.B.S. or an equivalent degree from any recognized University/Institute/College can apply for the Integrated PhD Programme in Biological Sciences, Chemical Sciences, Earth Sciences, Mathematical Sciences, and Physical Sciences. Candidates need to secure a minimum of 60% marks/equivalent grades in Honours/Major (if applicable), or 60% marks/equivalent grades in Aggregate (if Honours/Major is not applicable). Those who are appearing in the final examination of their degree course can also apply; for them, the eligibility marks are 60% based on the marks obtained in the undergraduate examinations held till the date of submission of the application form. Reservations for candidates will be as per Govt. of India norms. The qualifying marks for SC/ST/OBC candidates are 50% as per Central Government relaxation policy. For candidates whose final examination marks are not available at the time of interview, admission to the programme will be provisional. Such candidates would have to produce final marksheet to the Academic Office within 60 days of their admission and having secured a minimum of 60% of marks/equivalent grades in Honours/Major (if applicable), or 60% marks/equivalent grades in aggregate (if Honours/Manjor is not applicable). Attested copies of marksheets and certificates of all examinations starting from secondary examination. Confidential recommendation letters of assessment (signed hard copy) of the applicant from two teachers who have taught courses and would be able to evaluate the student as a potential research worker. The teachers should seal the envelopes and sign across the flaps.